The Look for Less is back for round 3! I’m so glad y’all have enjoyed this semi-regular series - it’s a fun one for me to put together! If you missed the first two, you can see those here and here. 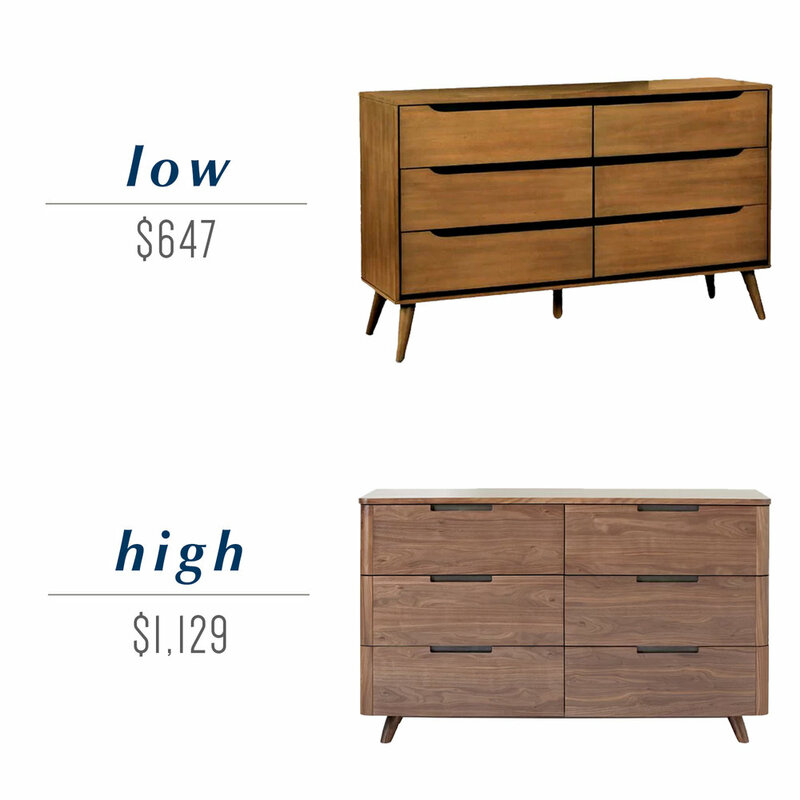 If you couldn’t guess from the title, this post is all about pitting two pieces of furniture or home decor against each other in a “high” and a “low” version. In other words, one falls into the more budget-friendly category and one is a bit more of a splurge. Though one isn’t necessarily better than the other, price does often correlate to quality, so bear that in mind as you’re comparing the high version to the low, but it’s ultimately up to you where you’d like to spend your hard-earned dollars. 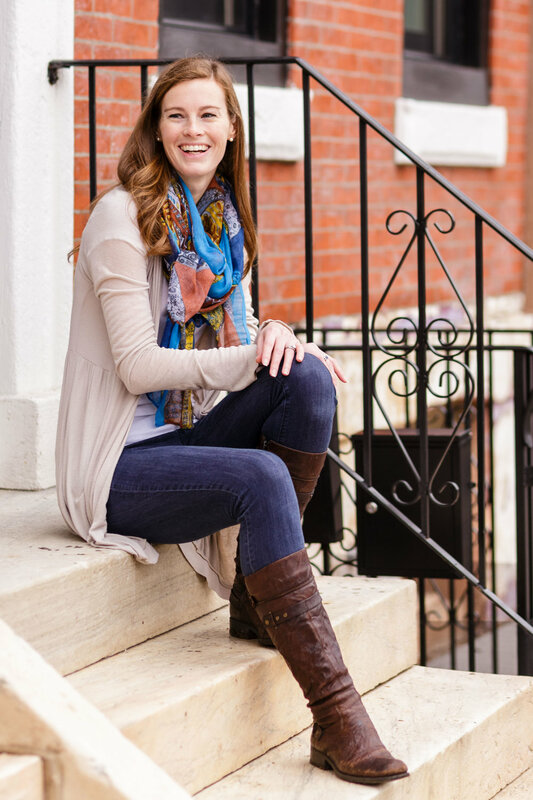 I’ve got five great items to share with you today: a light fixture, a tufted leather bench, a Persian-style rug, a wicker patio chair, and a mid-century dresser! Scroll on down to check them all out and let me know what you think!. Rattan has made a big comeback over the past few years and I love the way it can bring a coastal touch to any space. The texture is fantastic, and it feels both relaxed and sophisticated at the same time. Both of these rattan pendants are gorgeous and would look great hanging in a set of two or three (depending on how many you’d need) over a kitchen island, in a bedroom, or in an entryway for a more dramatic statement. The pendants have a similar look and feel, but are different sizes, so definitely take that into account! The “high” version also comes with the rope light cord you see, but you’ll need to purchase a pendant light kit for the “low” version. That will add a little bit to the overall cost, but you can get choose your price point on that - it doesn’t have to be expensive! Here’s a rope one that’s very similar to the one that comes with the “high” version if you’d like to mimic the overall look. This kind of bench could be used in so many places! Good spots would be at the end of a bed, along a wall in a foyer, or you could even use it as an ottoman. It’s hard to go wrong with tufted leather and a metal base. It fits in wonderfully with modern, masculine, industrial, and classic decorating styles. If you’re on a really tight budget, the “low” version will definitely give you the look, but if you can, I’d recommend going with the “high” version, which isn’t much more expensive. It’s made of genuine leather and is slightly longer (48” vs. 55”). I’ve seen SO much amazing patio and outdoor furniture so far this year. Many retailers are bringing the indoors outside and making outdoor lounge and dining spaces feel more like interior spaces. It’s a beautiful thing! 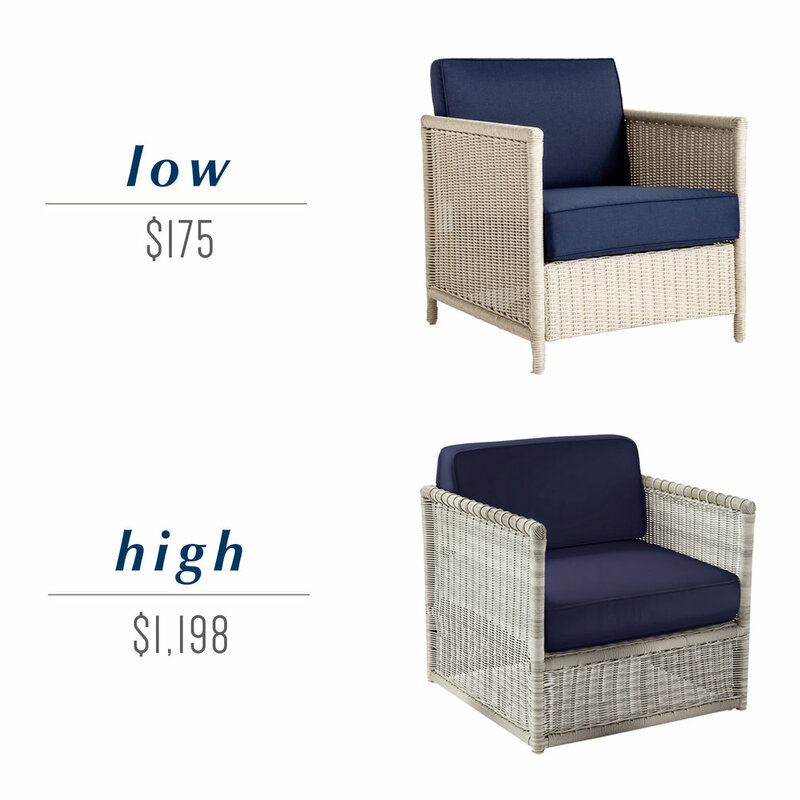 These two outdoor lounge chairs with navy cushions are just two examples of that. They come in at pretty dramatically different prices, and I think that it’s hard to resist the “low” version - it’s a deal for sure! It actually comes as a set of two (price shown is for one though). The “high” version is stunning though, so if you’re really ready to invest in good quality patio furniture that will last a long time, be sure to take a look at that one! I do love a good Persian-style rug! These are both beautiful options with a similar overall feel, but have slightly different designs. The light blue mixed with ivory, tan, and beige is really lovely combination, and it would work well in lots of different spaces. The “low” version is made of polyester, which is a durable fiber and is typically less expensive than other materials. The “high” version is made of viscose, which is super soft, but be careful because it can stain fairly easily! The price I shared for both versions is about an 8’x10’, which is a good size for many living rooms and bedrooms. What grabbed my attention with these particular mid-century six-drawer dressers was the cut out drawer pulls. Each dresser has a slightly different interpretation of those, but the idea is the same. These dressers add great storage to a bedroom of course, but you can also use dressers in other areas of your home too - they make good media cabinets and can even work well as entryway storage if you have the space. The differences between the two really comes down to price (which often correlates to quality), and personal preference on the style. Both have great reviews overall though! That’s what I’ve got for y’all today in the high/low game! Which ones are worthy of a splurge or save in your book? *This post contains affiliate links, which means Mix & Match Design Company earns a small commission from your purchase at no cost to you. Prices shown are valid at the time of posting and are subject to change.